Several studies, (2013 on mice in Sri Lanka, 2013 in Malaysia on dengue patient) shows papaya leaves would be the highly beneficial in increasing platelet. Take three leaves and crush it. Make a glass of juice. Two tablespoons you can take every six hours in a day till platelet gets increased to its normal range. Extract the juice from papaya leave without using water by using a cloth or you can press with your palms. You can take it 2 to 3 teaspoon at a time. You can take 2 to 3 times. Taste of juice is quite bitter, sometimes person unable to drink. You can add some honey in it. Repeat it till platelet gets normal range. Giloy (Tinospora Cordifolia) is an herbal herb which helps in increasing platelet. Giloy is known as Amrita. It has a properties of antibacterial, anti-inflammatory, anti-rheumatic, and anti-allergic actions. It has increase the killing ability of macrophages in the body, which would be responsible for combating micro-organism and foreign bodies. The stem of giloy plant, to be used to extract the juice, which helps in increasing platelet counts. Collects all material together which we require to make a juice. Giloy stems, soak in water for overnight. These soaked stems, amla and tulsi leaves is to be boiled. Boiled till the time, quantity remains half of its original quantity. Wheatgrass contains high in chlorophyll with a molecular structure. It could be produced significant increases in hemoglobin. Wheatgrass juice could be mixed with a little lemon juice and drink ½ cup daily. It has excellent nutritious and medicinal value along with having anti-anemic properties. International Journal of University has conducted study in 2011, that wheatgrass juice is helps inconsiderably increasing platelet count. Thoroughly rinse the chopped wheatgrass. Make it paste with using a pestle or mortar. Normal juicer is not able to extract the juice of wheatgrass. You can use strainer or sieve to press. You can take 2-3 servings of wheatgrass in a day. Aloe Vera is also used in Ayurveda to increase the medicine. It is work as a disinfectant, anti-biotic, anti-microbial, germicidal, anti-bacterial, anti-septic, anti-fungal and anti-viral. Polysaccharides stimulate macrophages which combat foreign bodies and viruses. It has some anti-oxidant properties. 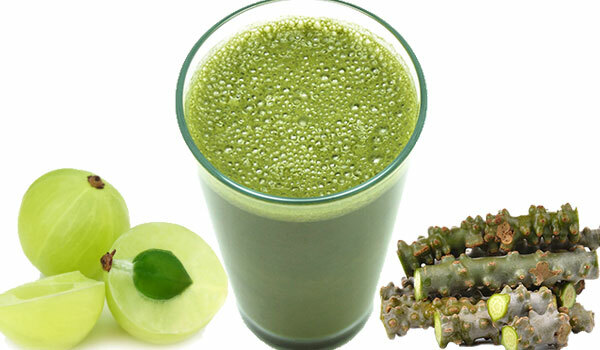 Herbal Concoction is herb is mixture of above four ingredients, which helps to increase the platelet very fast. You can mix all four juices together and drink it daily 1-2 times per day, this is a best remedy for increasing platelet. Wash the papaya leaves and wheatgrass. Crush it properly and extract juices from this. To be blended of aleo vera by using some water, if it is needed. Giloy stems, soak in water for overnight. Take 2 -3 glass of water for boiling, these soaked stems and tulsi leaves is to be boiled. Boiled till the time, quantity remains half of its original quantity, till the time, quantity remains half of its original quantity. If needed add lemon juice along with honey in this juice mixture. Drink it 1-2 times a day.